I had heard about this book some time ago but it fell by the wayside. Recently I was afforded an opportunity to read it and promptly did so. This book is published by Vision Forum which some of you may be familiar with. 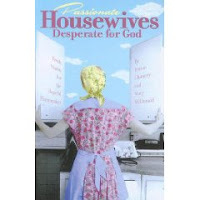 Written by two housewives, Jennie Chancey and Stacy McDonald, it is a book in which they attempt to do exactly what the subtitle suggests: offer fresh vision for the hopeful homemaker. Passionate Housewives Desperate for God desires to fly in the face of modern day feminism (think the type of feminism that either desires freedom from men, generally, or hates men, specifically) that would suggest that "just" being a housewife isn't what women are called to do. Chancey and McDonald, each homemakers and mothers of large families, are standing up to declare that one of the best jobs a woman could ever have is to be a wife and mother. On the whole, I agree with their message quite strongly. I believe that children are a treasure from the Lord. They are given as a blessing to families to enjoy and nurture. Children are to be cared for, loved and nudged to be the best people that they can be and it takes a devoted parents to see this course through from infancy to marriage of the child. It is a tough journey and not one to be underestimated. Parents who are doing their best to raise their children should be encouraged and cheered on as they see to this difficult (and incredibly rewarding!) task. Society really gives women a bad rap for wanting to stay at home and be a mom to their kids instead of entering the work force and "contributing to society" in a manner which would sooner separate them from their children than not. What Chancey and McDonald are attempting to do in this book is to dispel the modern myth that a woman cannot feel fulfilled while working in her home. They are standing up to the argument that says a woman's joy and happiness can be found when the woman is best utilizing her gifts to promote her. Instead they long for their reader to understand that a woman can be gloriously fulfilled in utilizing her gifts to aid and support her husband, children and family. In all of this, I do agree. I do have some points of contention in the way that they go about the particulars of being a housewife but I support the book in the spirit which it was meant. I gave up my career to be a stay at home mom and that was a great decision for me. I have no regrets about being home with my kid(s) so that I can be more actively involved in their lives. I find it exhilarating to be able to be with my children get to see first hand how they will go about leading the life God has given them. If I have moments of sheer frusteration and exhaustion, they are overwhelmed by the future that I have hope I will see when it comes to the success of my children. I also do not pretend that each and every home looks the same. In fact, all of our homes are uniquely different and that is exactly the way that it is supposed to be. The authors of this book encourage the reader by saying that there is not one single mold that we must follow in order to have godly families and I commend them for saying so. We should feel free to be different and pursue the gifts and talents that God has given us. I don't think we should revel, per se, in our differences but we should politely take notice of them and respect them in so much as we are able. We are to honor one another in our thoughts and our words. To nitpick and tear each other apart for building up different homes and families is counterproductive. 2. Building Her House: Commonsensical Wisdom for Christian Women which I recently finished reading so watch for that review over at 5 Minutes for Books. I am glad that you were able to read this book and write on it. I've heard much of it and some day hope to read it as well. Being new the the SAHM team I've had lots of new challenges to over come and adjustments to make. And it sounds like this book would be an encouragement and affirmation to the path I've set my feet to. Thanks for posting. I'm intrigued! Yet another title to add to my wishlist (I just added Building Her House today). Have you seen the new Nancy Wilson Collection (3 Vols.) from Logos Bible Software? I thought you might be interested!